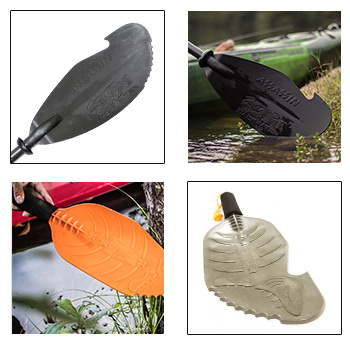 Head up the creek with a paddle designed to handle any obstacle that might arise. As versatile as they are durable, the Backwater Paddle Company’s patented designs give paddlers the power to push off the shore or rocks, grab treed lures and float on with confidence through every leg of the journey. Designed by a retired U.S. Navy survival instructor, master naturalist and kayak eco-guide, Backwater Paddle Company’s kayak paddles are a cultural phenomenon in paddle innovation.Full-sized and hand paddle options mean there’s something for everybody, from expert anglers to adventurous amateurs. The ASSAULT Kayak Fishing Hand Paddles give you the freedom to fish, photograph or hunt while simultaneously moving your boat, while the ASSASSIN Kayak Paddle gives you the edge you need to comfortably and confidently kayak. Interested in carrying Backwater Paddle Company Products? Contact Us.